So much of the country is dealing with crazy cold weather and/or tons of snow right now. At our house we’re on our 7th snow day! First priority, of course, is keeping everyone warm and safe. Second priority? Keeping everyone sane! At our house, we’ve got a 10-year-old, 8-year-old and 4-year-old and, let’s just say, being stuck indoors together for long stretches of time can be challenging if we don’t plan for it. The problem is mostly that it can be hard to find activities that engage kids of different ages… this leads to one or more of them getting antsy and can often devolve into sibling fights. But there’s good news, friends! Our family recently took a week-long trip to a cabin in Montana and it was there that I discovered the secret to happily engaging all 3 kids for unheard of amounts of time. Ready?? Give them a common, creative goal. That sounds vague, I know, but there’s actually a very specific kind of task that works best here. The kids need to be recruited to both conceptualize and create something completely original together. The first time I saw this play out was without any prompting from me. My two older kids decided to make their own board game. That meant they had to work together to discuss the rules, design the game, and then actually make the game board and pieces. All of this took hours and I was astounded by how long they worked on it together without fighting. A few weeks later, it happened again. Only this time they put together a variety show to perform for me. There was a choreographed dance, a mini piano recital, and even a few magic tricks (psst – this is a great magic set for preschoolers and here’s one perfect for bigger kids). Build an Imaginary World – My daughter has never really had an interest in video games like her brother. This week, though, their school had three full snow days followed by two half days and it was during that time she changed her mind. She convinced her brother to let her try out the creative mode of Minecraft with him and they’ve been deep diving all week. So far, they’ve created their own mansion with separate wings for each of them containing secret passages carved into mountains, private libraries, and master bedrooms with their own hot tubs. The best part is when screen time’s over, they don’t stop collaborating! They just switch to paper and pen, laying out intricate blueprints of what they want to build next. Build a Literal World – Fort building is a classic kid activity for a reason! We absolutely love Fort Boards (see my detailed review in this gift guide), but all your really need is some sheets and couch cushions and you’re good to go. My kids have built forts behind our couch, under our dining room table, and around their beds. Create a Performance – See my above comments about putting on a family talent show, a play, or musical performance. Plan a family Trip – During library time at school, my son recently got the assignment to plan a family trip. He had to use the internet to pick a spot, plan travel, find lodging and scout out things to do. He LOVED it! Of course, you’ll want to prep your kids about wether or not this trip could ever really happen (and parameters if it did), but how fun would it be to take a mini-vacation planned completely by your kids?! Once the trip is planned, it would also be a great opportunity to work together as a family to get the money to fund it through chores and saving. So those are my tips, I hope they’ve sparked some good ideas on how to keep the family engaged and happy while stuck indoors. Stay safe and warm out there! P.S. Extra long days inside are also the perfect time to have a family meeting and set up some new routines. 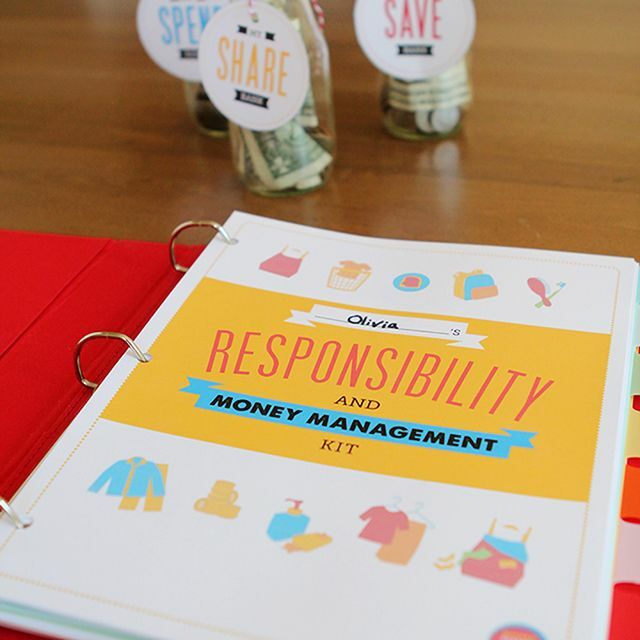 Use our downloadable Kids’ Responsibility & Money Management Kit to make it fun! 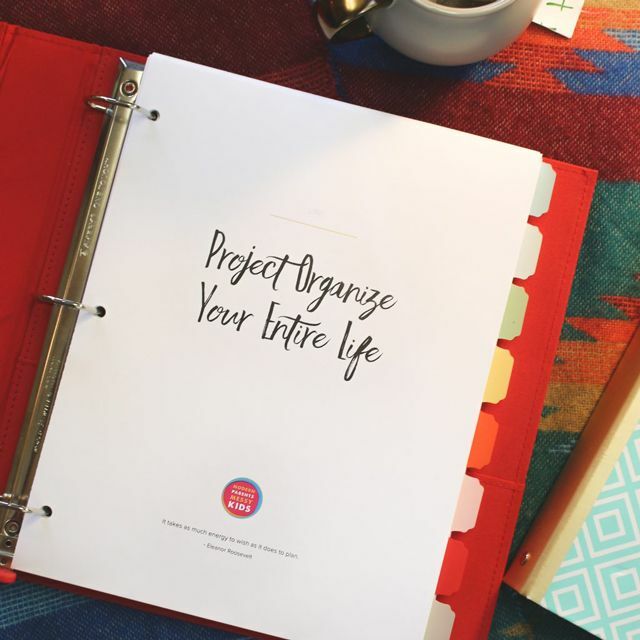 Plus, your kids can spend a lot of time designing and decorating their own binders and banks- yet another way to kill some time this weekend.